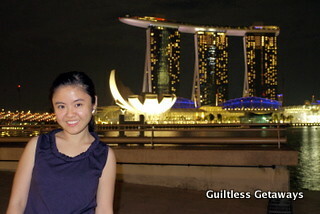 Girl Kuripot Girl Kuripot: Marina Bay Sands Singapore Art Installations, Win a 2N Stay! Marina Bay Sands Singapore Art Installations, Win a 2N Stay! This is a chance to win a 2N Stay at the Marina Bay Sands Hotel in Singapore plus a pair of tickets to see the art installations for yourself! I so want to go back to Singapore! Twice was not enough last year with all my Singapore food trips and sightseeing in Singapore. All you have to do is to head to the Travel + Leisure Southeast Asia - Marina Bay Sands Singapore Contest Page and answer 2 questions. Contest ends April 30, 2012! Just imagine marveling at the grandeur of Marina Bay Sands Hotel, having access to the ArtScience Museum and window-shopping at the big mall adjacent to it. Again, I'm craving, craving, craving for satay sticks, cereal prawn, chili crab and beancurd... Haha. All of the links below are different posts. Click here to join the T + L Southeast Asia - MBS Singapore Giveaway.